Carlow is a wonderful county full of amazing archaeology and historic sites. I recently visited the village of Myshall located at the foothills of the Blackstairs Mountains a short distance from the Carlow/Wexford Border. Myshall is traditionally held to be the birthplace of the great Irish saint St Finian, founder of the celebrated monastery of Clonard in Co. Meath. An early medieval church dedicated to the saint sits at the centre of the village. 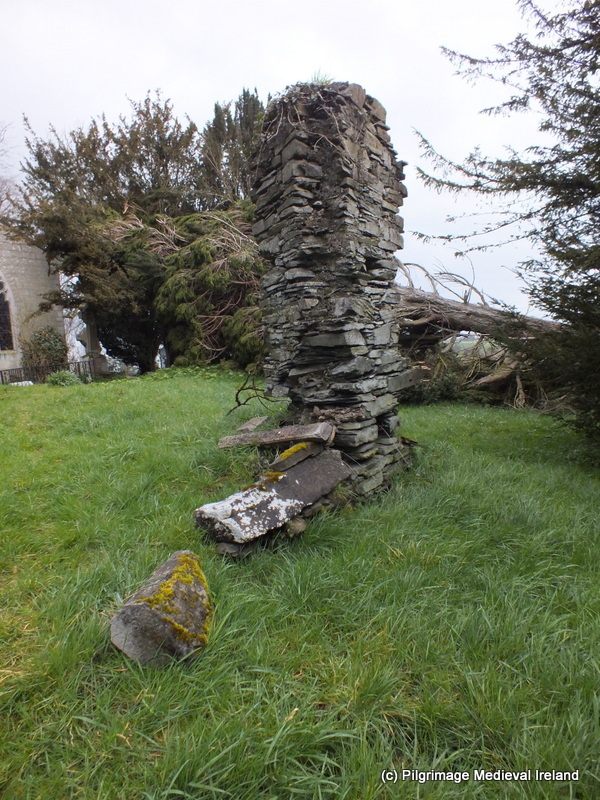 The church now in ruins is a pre-Norman structure and only the west gable of the church survives to any great height. Within this wall is a very fine semicircular arch doorway. The site is also associated with St Brigit. 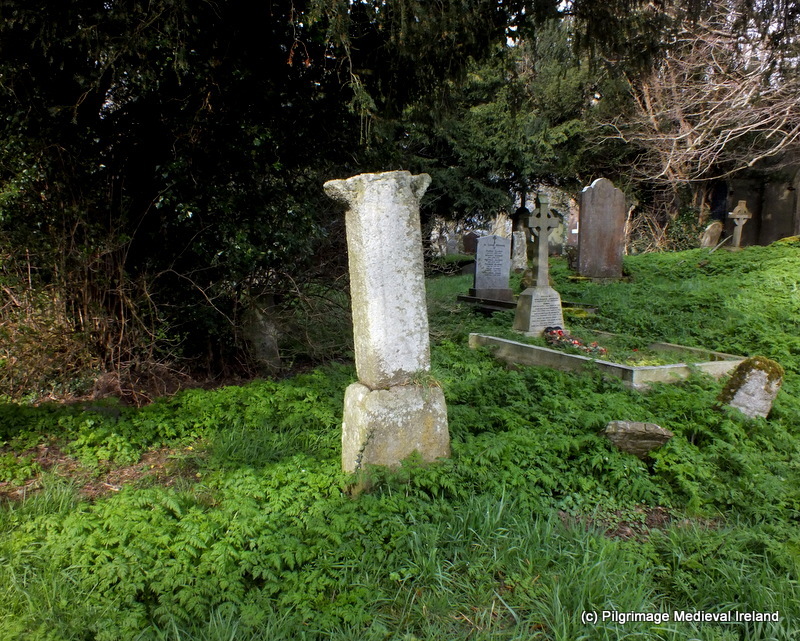 A short distance from the church is two-basin bullaun stone known as St Brigit’s Stone. Local folklore connects this stone to a series of parallel ridges called the ‘Witch Slide’ on the nearby Blackstairs Mountains. Blackstairs Mountain overlooking Ballymurphy, County Carlow. By Sarah777 (Own work) [Public domain], via Wikimedia Commons. It was said that a Carlow witch had a falling out with her neighbour in Co Wexford and she decided to throw a stone at her. As she began to throw the stone she slipped and fell creating the ridges. 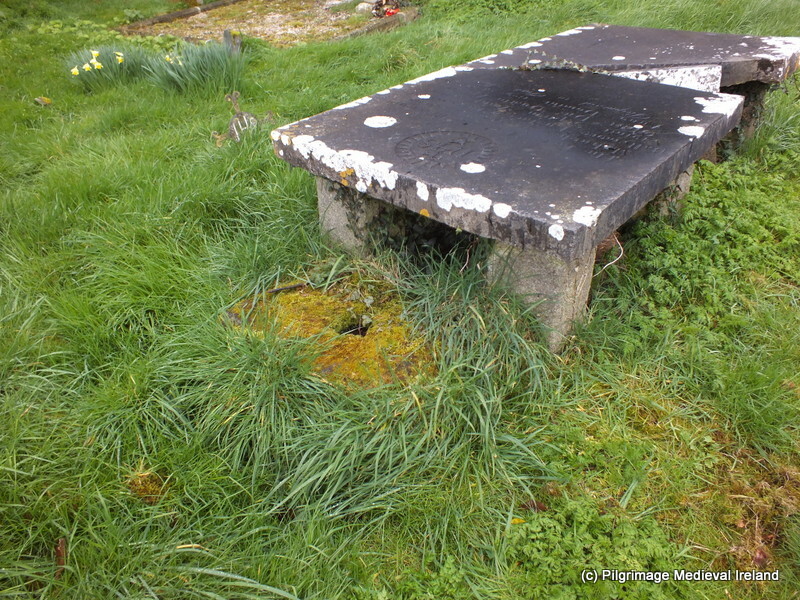 A standing stone in the townland of Clonee was said to be the stone she was trying to throw. It was said the marks of her knees where she landed were preserved in the bullaun stone at Myshall. Outside the graveyard circa 18m from the church is a holy well dedicated to St Brigit. The well is now dry and its structure has been incorporated into a modern grotto. Both the well and grotto are dedicated to St Brigit. 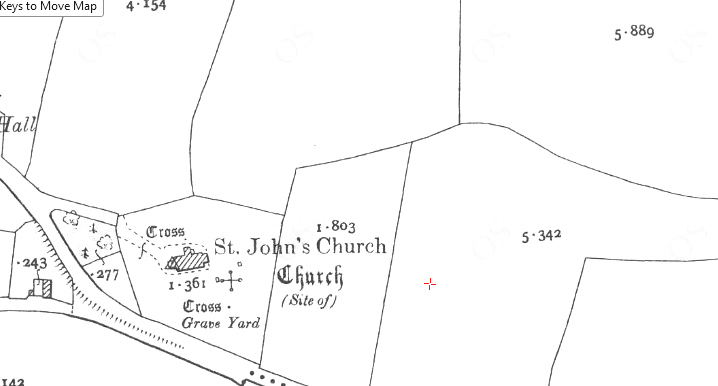 The Ordnance Survey Letters for Co Carlow state that a pattern was held here annually on the 14th of September the feast of the exultation of the Holy Cross, the Titular feast of Myshall. The pattern day coincided with the Myshall Sheep fair which was held in the village up to the 1960’s. By the 1930’s all memory of the traditions of stations or cures had been lost (O’Toole 1933, 13). According to O’Toole writing in 1933, the spring from which the well was supplied came from the graveyard and the spring water flowed from here through a drain under the boundary wall. Three stone steps lead down to the well, and there was a large opening for the overflow. A few yards from the well there is a large flag set obliquely in the ground; in the centre of this flag there is a round aperture, which apparently was meant to let water pass through while at the same time, acting as a dam (O’Toole 1933, 13). The area around the well has undergone some landscaping and it is now a feature of an amenity park which incorporates a large pond and water wheel. 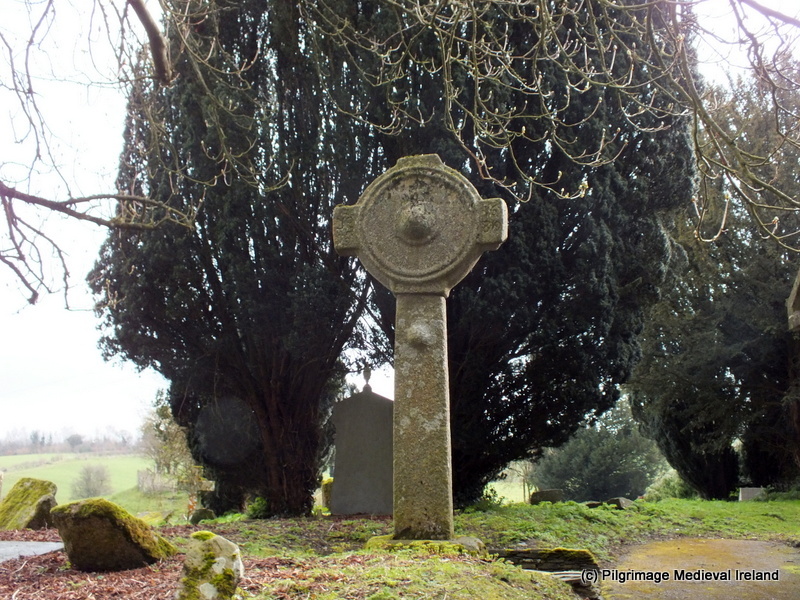 Last weekend I paid a visit to a number of sites located along the Wicklow/ Kildare border. I began my mini road trip, which was cut short by the rain, with a visit to Ballymore Eustace. This is a small village located in Co Kildare. During the medieval period Ballymore was part of a manor under the control of the Archbishop of Dublin and the land around the eastern edge of the village is still known as Bishop’s land. Historical sources record that a castle was built here in the 12th century. In the 14th century Thomas FitzEustace was appointed by the then archbishop as the constable of the castle. This position was held by a number of his descendant and so began the areas association with the family. 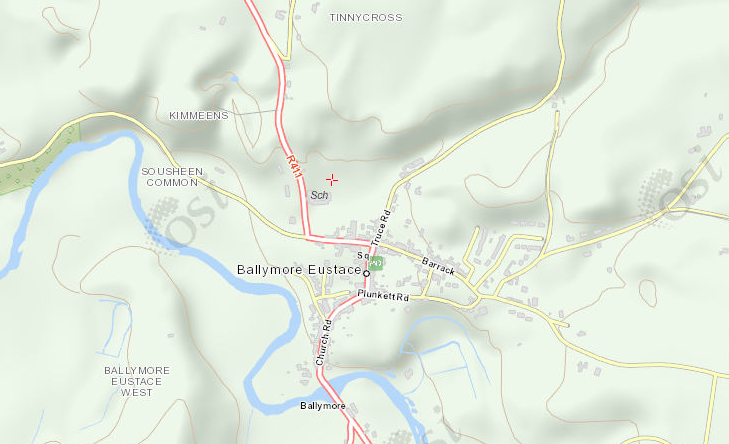 Ballymore was no backwater and was situated in a strategic location linking Kildare and the Wicklow mountains. A parliament was held here in the year 1389. The castle no longer survives but evidence for an early medieval monastic settlement and later medieval church, is found on the eastern outskirts of the village, at the site of the modern Church of Ireland church, dedicated to St John. The earliest historical reference to a church at Ballymore dates to 1192. Historical sources indicate this medieval church was dedicated to the Blessed Virgin. The presence of two high crosses and a number of early medieval grave slabs indicate that there was an important religious settlement located at this site from a much earlier date. 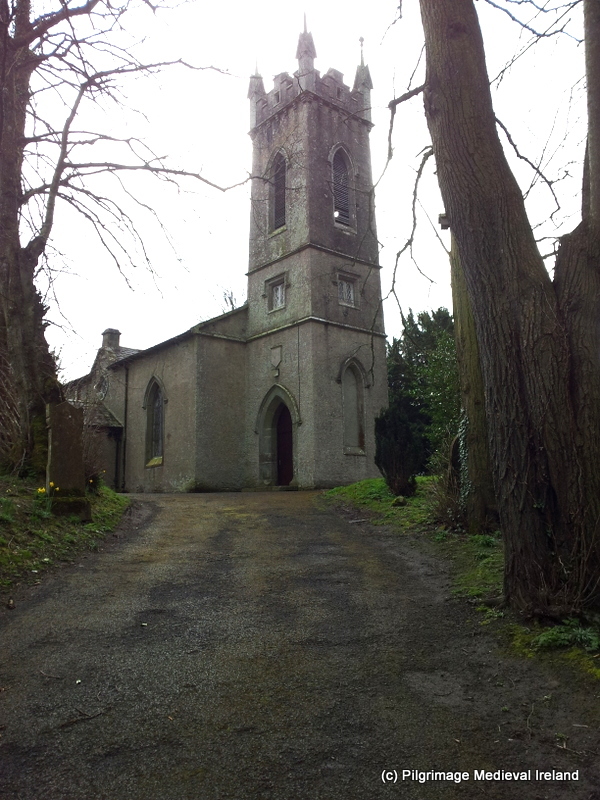 Today the site consists of a 19th century church built in 1820 surrounded by a historic graveyard and mature trees. This is a very picturesque site and I would love to come back here on a sunny day. The early medieval remains are scattered around the graveyard. The most spectacular is a large granite high cross over 2m in height, located on the north side of the 19th century church. The cross has a narrow shaft that holds up a solid ring and short arms and it sits in a large undecorated rectangular base. The west face of the cross has a central boss located at the centre of the ring of the cross head and a second boss at the top of the shaft. 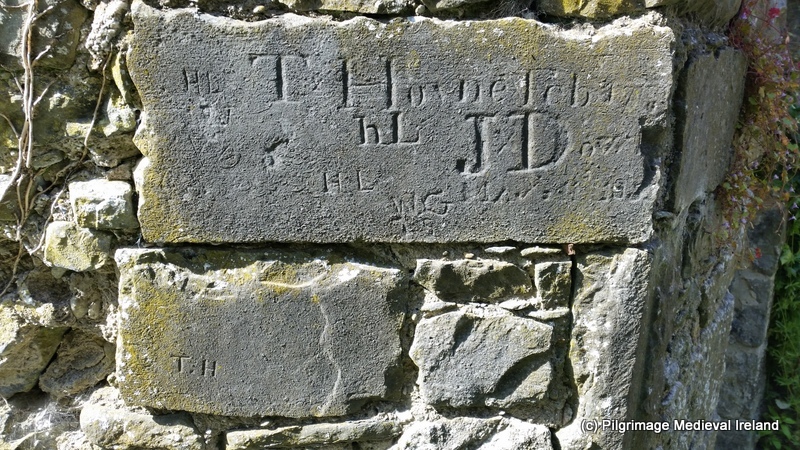 A secondary inscription was inscribed onto the head of the cross and reads (anticlockwise) AMEN/NO (r) THE 9 ERECTED in 16/89/ BY/ AM WALL/ IHS. The inscription commemorates the crosses re-erection in 1689. 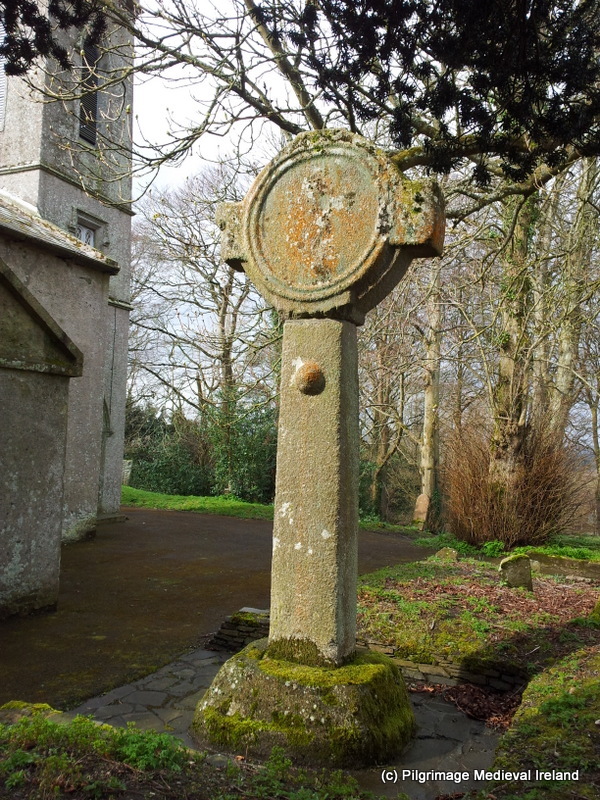 The east face of the cross is plain with a boss at the top of the shaft and moulding around the circle of the cross head. A second smaller high cross is located to the southeast of the modern church. 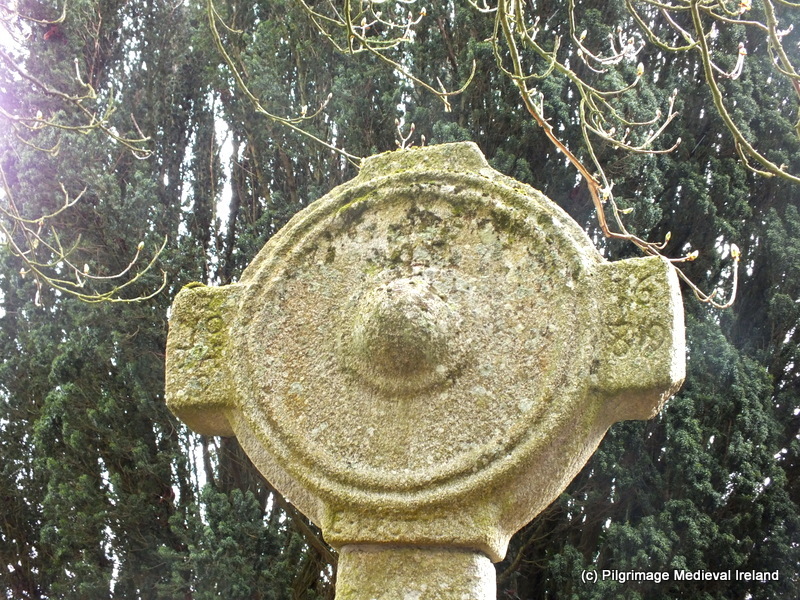 This plain cross is also made of granite but is not in as good repair as the larger cross. The head of the cross was broken in the past and all that remains today is the rectangular shaft which sits in a triangular base. Traces of the medieval church mentioned above still survive with the footing of a wall in the south and a fragment of part of a window opening in the east wall still visible. The church was described as being in good repair in the accounts of the Royal Visitation of 1615 but it deteriorated greatly over the centuries. Partial remains of a window in of the east wall of medieval church. Fragments of the window mounding found beside wall. Along with the high crosses and the church there are seven early medieval grave slabs located around the graveyard. 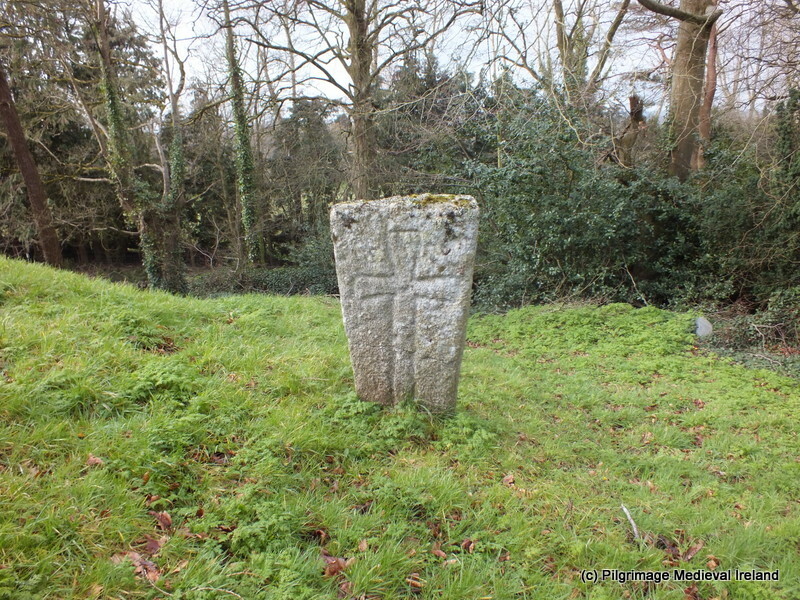 The stones are very similar to those found in the nearby graveyard of St Kevin’s Church of Ireland church and date to around the 12th century. One of the nicest examples is found close to the west wall of the modern church. Apart from the early medieval remains there are many interesting 18th and 19th century graves stones scattered around the graveyard including the burial place of the uncle of the Irish revolutionary Theobald Wolfe Tone (1763 –1798). 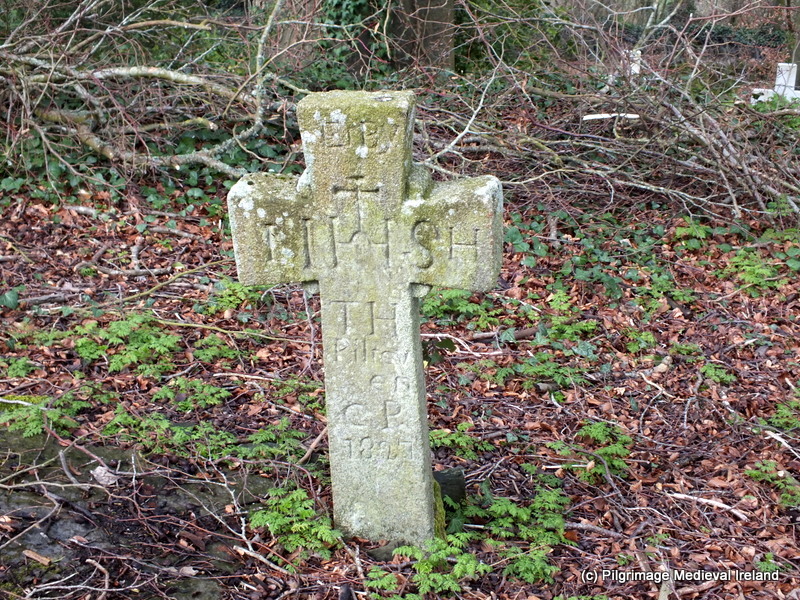 There are also a number of distinctive granite crosses dating to the early 19th century. I have seen similar examples at other graveyards in the area. Finally at the east end of the graveyard there is a small stone, located beside a large table top tomb,which looks like the base of a cross. The water from the stone was used by local people as a folk cure to cure warts (pers comm CJ Darby). Unfortunately my time here was brief but I look forward to returning again and spending more time looking around . 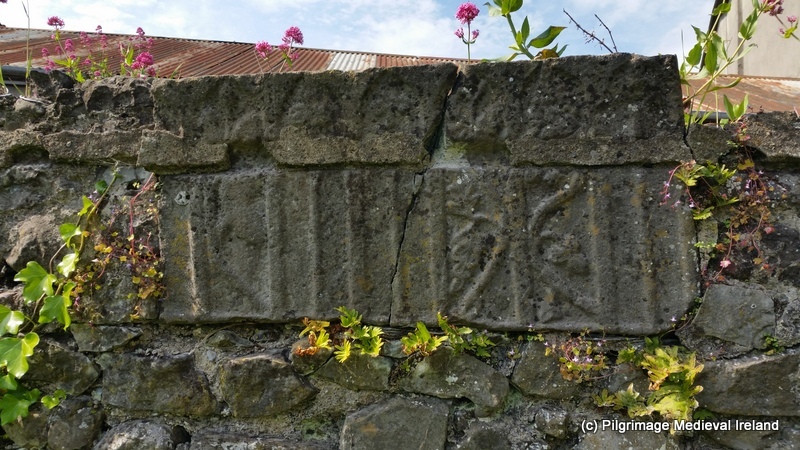 According to an information plaque at the site within the 19th century church there are additional medieval features such as a medieval font which came from Coughlanstown and a 16th century effigy of a FitzEustace knight brought here from Old Kilcullen. Unfortunately the church was not open on my visit but I hope to arrange a visit another day. 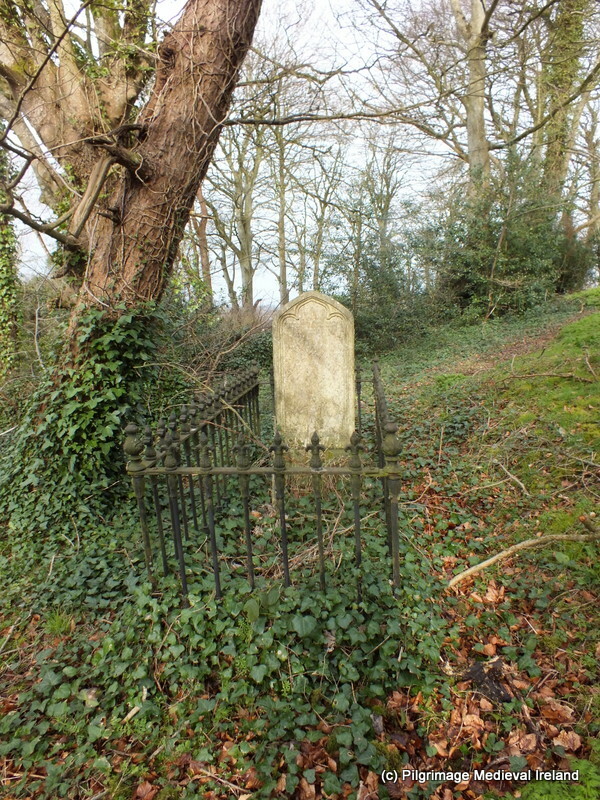 Corlett, C. 2003, The Hollywood Slabs – some late medieval grave slabs from west Wicklow and neighbouring Counties, Journal of the Royal Society of Antiquaries of Ireland, 133, 86-110.Corlett, C. 2003, The Hollywood Slabs – some late medieval grave slabs from west Wicklow and neighbouring Counties, Journal of the Royal Society of Antiquaries of Ireland, 133, 86-110. Grogan, E & Kilfeather, A. 1997. Archaeological Inventory of County Wicklow. Dublin: The Stationery Office.